Autographs 4 Alopecia: MVP...Tommy Everidge! One of our favorite players is Tommy Everidge. This was Tommys first season in Lancaster and he was quite impressive! Tommy always had time to talk to us, sign autographs, and help us by signing some things for our silent auction. Tommy spent some time with the Oakland A's back in 2009 and we could see why! He was at or near the top in many offensive numbers as well as setting a few records. In the end, he was named the 2011 Atlantic League MVP! Congrats Tommy! Everidge finished the season with league-leading marks of 41 doubles and 28 home runs. He also topped the circuit with 160 hits, 285 total bases and was second in runs scored and RBI, losing out of a share in the latter with Bridgeport getting a play-in game. His .319 average was sixth best in the league.The total of 69 extra-base hits set a new league record, topping Brian Becker (Nashua, 2005) by one, despite having only 125 games on the schedule. 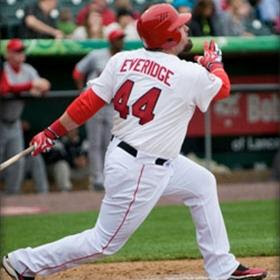 Everidge started in all 125 for Lancaster.Both the doubles and home runs totals were Barnstormers franchise records. He also established new club highs during the year by scoring a run in 12 consecutive games and driving in a run in eight straight. His biggest month was August when he hit .394 with 36 RBI in 27 games and was selected as the Atlantic League Player of the Month. Tommy was always great with us and even continued to support us after this classic video where he was voted messiest and funniest guy in the clubhouse! After this season, Tommy does not belong in Lancaster! He deserves another shot in spring training with an affiliated club. He would be a great 1B/DH option for a lot of clubs!